Who said bread has to be boring? Whole wheat bread is filled with loads of fibre and minerals to keep kids feeling fuller and more energized for longer. 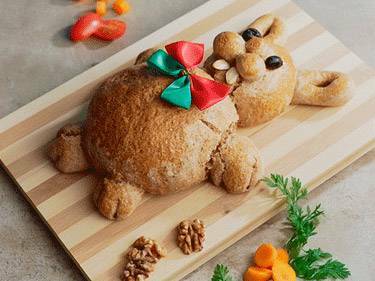 Let the little ones be creative in the kitchen by giving our Bunny Bread a go! Pour the water into a bowl and add the yeast. Add flour to the yeast mixture. Step 3: Add honey, oil, salt, and water. Brush another bowl with olive oil, place the dough in the bowl and cover with plastic wrap. Leave the dough to rise in a warm place for 60 minutes. Time to get the kids involved! Use ¼ of the dough to make the body. Form the dough into an oval and place about 3-4cm from the bottom of baking sheet (to leave room for legs). Take 1/8 of the dough and form into an oval for the bunny's head and place just above and touching the body. Take 1/8 of the dough and split in half. Form each of these into long ropes. Double each over to form ears. Put them in place and tuck the loose ends under head on each side. Use ¼ of the dough and form into four rectangles, shape into two legs and two arms and place against the body of the bunny. Cut two slits at the end of each to make fingers and toes. Use remaining ¼ of the dough to form a nose and cheeks and any remaining dough to be creative! Add two raisins for eyes and two almond slices for teeth. Cover the rabbit and leave to rise for 30 minutes. Meanwhile, preheat oven to 200 oC. Whisk an egg and brush on the dough.